I am very flattered to have been asked to be editor of the fine Landscape Photography Magazine. There is no doubt that LPM brings a huge amount of pleasure to thousands of readers throughout the world with the ratio of images to text being so carefully considered. 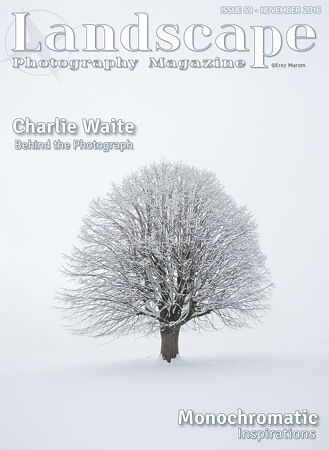 The striking images in this December issue remind me so powerfully that landscape photography is to be seen. When I look back at the Charlie I was at the dawn of my landscape photography, in the late 1970’s, I recall my Nikon F Photomic 35mm camera being on my tripod, and pointing it at a combination of trees, stone walls and water with a backcloth of a modest hill; I thought what lay in front of me then was a wonder to behold. From that Nikon (now worryingly described as vintage) to my whole plate Gandolfi and my Hasselblad, in essence very little has changed. I continue to point my camera at what to my eye and mind appears to be beautiful. The profound and multi faceted enrichment remains as it was all those years ago. I am proud to be amongst so many likeminded folk who are passionately pursuing the same end. Flowers are some of the most colourful things to photograph; Alison Staite argues that you can see a different side of them by capturing them in monochrome.